Please review the rules and complete your online registration. This document is property of Soul Anchor, Inc. dba Frank and Fran’s The Fisherman’s Friend (“Frank and Fran’s”). 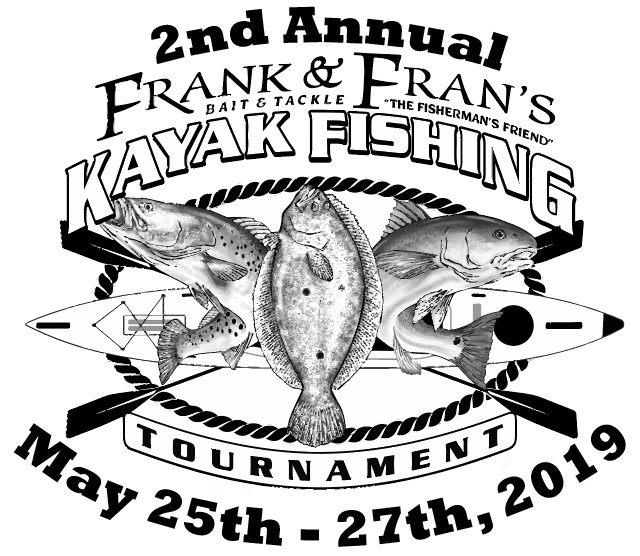 All anglers entering the Frank and Fran’s 2nd Annual Kayak Fishing Tournament (the “Tournament”) agree that neither Frank and Fran’s nor any of its owners, members, employees or sponsors are in any way liable for any injuries or accidents that may occur during angling or kayaking in the Tournament. You are entering the Tournament exclusively at your own risk. Failure to comply with these Rules shall be grounds for disqualification WITHOUT REFUND. To participate you must read and agree to the Terms & Conditions set out below. No one under the age of 18 years of age may enter the Tournament, unless a parent or guardian shares a tandem kayak or canoe, and minor child must be registered as a separate participant. NO MINORS IN SOLO WATERCRAFT. There will be a non-refundable registration fee for registering in the Tournament. All entrants agree that any photo submissions posted to the tournament may be used by Frank and Fran’s at its discretion for current or future promotional purposes. The Tournament Rules or time duration of the Tournament may be changed without advance notice but will be announced to registered anglers at such time as any changes are made. Cancellation Policy: Tournament will take place rain or shine! Should a participant have to withdraw from tournament due to personal reasons, the full registration fee will be returned if cancelled 30 days before the event. Should a participant have to withdraw inside the 30 day window the participant may choose to roll entry fee over to 2020 tournament. After reading and agreeing to all rules and terms, you may enter The Tournament. The cost to enter the tournament is $65, which includes Tournament T- shirt, Tournament measuring device and Awards Dinner. Additional tickets to Awards Dinner are available for an additional $7 each. Entry will be accepted up until April 27th 2019. Additional entries will be allowed at the Captain's Meeting, held on May 24th, 2019. Entry fee at this time will be $75. Unfortunately we cannot guarantee to have your size T-shirt for late entries. All catches must be made from a kayak, SUP, canoe/hybrid, or a canoe 16 feet in length or less. No Wading or Out-Of-Kayak fishing. Fish must be hooked, fought and landed from the kayak. No length restrictions on kayaks, SUP, or canoe/hybrids. Kayaks with sails, tandem kayaks, kayaks with pedal drives and kayaks with stabilizers are allowed. Motorized mechanics for propulsion on kayaks are NOT ALLOWED! All fish must be caught on rod and manual reel. Electric reels, Spearfishing, Bowfishing, gigging, trot lining, or jug lining is not permitted. Rod sharing or assistance from boats is prohibited. All entrants and competitors agree to abide by all local and federal boating, recreational and game laws. Inch lines must be visible on the measuring device. Entire fish MUST be in the photo and must show the fish length from upper lip to end of unpinched tail using straight line and no curves. Catch and release is at the discretion of the angler. Each angler is personally responsible for adhering to all local and federal catch limits as it pertains to fish kept by angler. All entries MUST have the entire fish in the photo. For larger fish, please make the best possible attempt to include the whole fish along with the measuring device provided. If the Organizers feel the submissions are questionable because of unclear photos, inaccurate size reported, poor attempt at getting the whole fish in the photo, or any other reason leading to the submission not being properly eligible, then the submission may be returned along with directions for correcting the problem. To prevent this disqualification of a catch, take several pictures (clear photos) of each fish to help validate your catch. Pictures are required for all catch submissions. Photos must show the entire fish. Shark bite or other partially mutilated catches will not qualify. You will receive a confirmation e-mail that we received your image. If you do not receive a confirmation email, you will need to call the Tournament Headquarters to notify us and provide proof that the photos were sent and not received. THE LEGAL AGREEMENTS SET OUT BELOW GOVERN YOUR PARTICIPATION IN THIS TOURNAMENT (THE “EVENT”). IF YOU DO NOT AGREE TO THESE TERMS, DO NOT PARTICIPATE IN THE EVENT. You agree to observe and obey all rules of the Event as set out in this document. You agree to allow Frank and Fran’s to utilize photographs of me with or without my name and for any lawful purpose, including for example such purposes as publicity, illustration, advertising, and Web content. You agree that you will comply with U.S. Coast Guard regulations for kayak use. You agree, to the extent permitted by law, to indemnify and hold Frank and Fran’s, its directors, officers, employees, agents and sponsors harmless with respect to any claims arising out of your participation in the Event. This means that you cannot sue or recover any damages from Frank and Fran’s its directors, officers, employees, agents or sponsors for any claims, including personal injury or property damage, arising out of your participation in the Event.